A new sensor system developed in Saarbrücken, Germany can not only carefully control drying processes in industrial ovens, but can deliver reliable air humidity measurements even at high temperatures and in the presence of other background vapours. Professor Andreas Schütze, project manager Tilman Sauerwald and their research team at Saarland University have developed with partner companies a sensor system that precisely monitors industrial drying, baking and cooking processes. The new system improves product quality, optimizes the production process and lowers process energy demands. The project has received funding from the Federal Ministry of Education and Research’s priority funding programme ‘KMU-Innovativ’ that promotes innovative technology in small and medium-sized enterprises. The engineers will be showcasing their heat-resistant sensor system from the 1st to the 5th of April at this year’s Hannover Messe (Hall 2, Stand B46). When food is being baked or steamed as part of an industrial production process, it is important to keep a close eye on humidity levels. If bread or baked goods lose too much moisture or lose it too quickly, the final products will not have the required properties. If, on the other hand, you can control the humidity in the oven precisely, the croissants will come out perfectly fluffy and the bread will have a deliciously crisp crust. ‘Precision monitoring of humidity can have a crucial effect on the quality of the products. Knowing the humidity levels allows us to carefully control the temperature and air volumes during the production process, and thus also save on energy,’ says Professor Andreas Schütze of Saarland University – an expert in the field of sensor and measuring technology. Precise measurements of moisture content is also critical when drying wood, textiles and coatings in industrial dryers – particularly to prevent heat damage to the materials. When making humidity measurements it is essential that temperature fluctuations are recorded precisely, as incorrect temperature readings can falsify the humidity data. Another problem that has to be addressed is the fact that other gases are also released at the high drying temperatures used in industrial ovens and dryers. For example, alcohol is emitted during the baking process and numerous volatile compounds are released when paints or coatings are dried or cured. Up until now, conventional humidity sensors have struggled to monitor relative water vapour levels due to the presence of these other substances in the hot air. And these airborne compounds can significantly shorten the lifetime of the sensors or even damage them. ‘In such cases, we talk about the sensor becoming poisoned,’ explains Tilman Sauerwald, senior scientist in Schütze’s team. When all these factors are taken together, it explains why the humidity measuring systems available up to now have had short service lives and have been either not particularly precise or very expensive. 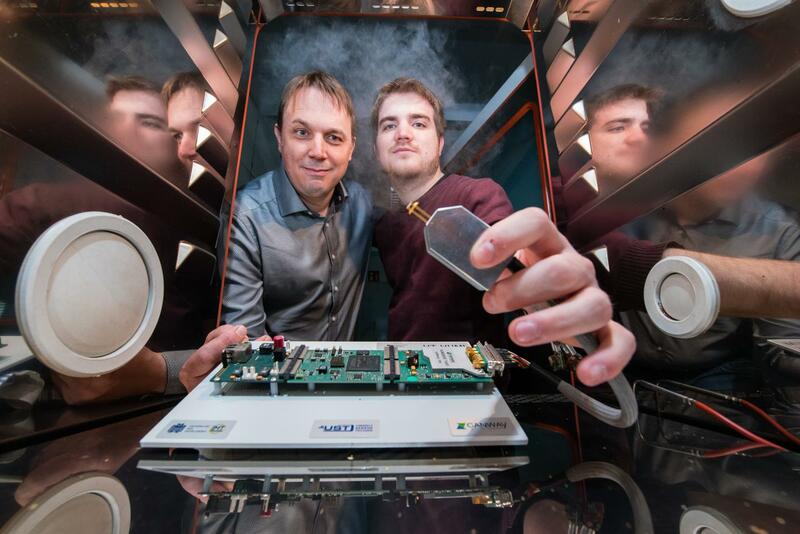 Measurement technology experts at Saarland University have developed a sensor system that can determine the humidity in industrial ovens and dryers with very high accuracy even at extreme temperatures and in the presence of background interference from other gases. The measurement technology used is complex, but it does far more than simply recording data on individual quantities. ‘We use a special ceramic sensor in combination with a Fourier transform impedance spectrometer. This allows us to make measurements across a large dynamic range and gives us excellent resolution over a wide range of temperatures,’ explains Henrik Lensch, a PhD student in Professor Schütze’s team. The researchers measure the electrical impedance (i.e. the frequency-dependent resistance to current flow) at different frequencies and compute from this the equivalent resistance and equivalent capacitance values as well as a broad spectrum of other quantities. ‘The resulting spectral data then undergoes model-based analysis,’ explains Tilman Sauerwald. The analyser unit uses mathematical models to extract those parameters that are relevant to the humidity measurements. The analyser is capable of identifying and filtering out those interference signals that have nothing to do with the humidity. Using this approach, the sensor system can also identify when an error condition or fault occurs. The research project is a collaboration between Professor Schütze’s team and the companies Canway Technology and UST Umweltsensortechnik. The research scientists will be exhibiting their sensor system at Hannover Messe and will be looking for partners with whom they can develop their technology for new applications. Press photographs are available at http://www.uni-saarland.de/pressefotos and can be used free of charge.